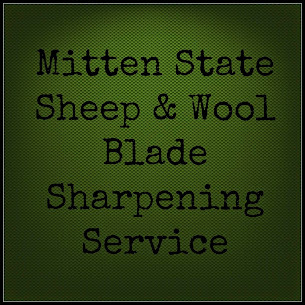 Mitten State Sheep & Wool : Black Sheep are Welcome Here! Delaney has been studying a 4-H, Sheep Resource Book for Market and Breeding Projects. I noticed that they had a section on wool. I was reading through the information and it states all of the reason to love wool such as: It is elastic, it holds shape and will regain shape even after stretching, it resist wrinkling and sagging, it is absorbent, and it is a great insulator. It is also nonflammable and a strong fiber. Then they list the reject conditions for wool which include: Seedy and Chaffy wool, Burry wool, wool with manure tags, tender wool, and COLORED wool. It is true that COLORED wool is not desirable in the wool markets (co-op and wool pools) because it cannot be dyed. But here at Clearwater Farm we love our black sheep and their curly locks. We do not sell our wool through the standard markets. We sell our wool to Fiber Enthusiast, who like us, love natural colored wool (which is anything but white) and all it has to offer. so beautiful....red, black, white and everything in between. Love them ALL!!!!!!!! I agree! I am excited to see how the Tunis wool spins. That is true! So many variations. I grew up thinking sheep were white! Never had a clue they come in all sorts of colors. I like the black wool. So pretty. p.s. I just noticed my blog button in your side bar. Thank-you! We have had ewes have twins, one black and one white. I love colored sheep. Especially brown. And your sheep are all so pretty. All of them! Thanks. I have had some Romney's in the past that were more brown. Very pretty coloring. Sandra, Your second picture is so fun! After attending the Iowa Sheep Industry Association Lamb and Wool Festival last June I can attest that the fiber industry is alive and kicking. I had no clue that there were so many people interested in fiber spinning, weaving, dying and more. I think it is exciting that you have a niche wool market and love sheep! Thanks! I love the Fiber Festivals. So many talented people. It is amazing the things they create with fiber!! Your sheep are just beautiful! We had one black sheep many years ago before we got started with goats. I named her....Fern. I know the varied colors of wool you have make wonderful, richly colored yarn. Good for you! Fern, thanks for stopping by! I love your sheeps :-). I had no idea that black wool color is actually discriminated against in the market! Boo. Thanks for teaching me something new and thank you for being a regular contributor at The Clever Chicks Blog Hop weekly! I'll be featuring your beautiful black sheep on this coming week's hop, so please feel free to grab a featured button! Sandra, your black sheep, ALL your sheep are beautiful! I adore the many shades of russet and mocha and charcoal and ebony and ivory and everything . . . It's all wonderful! Do you sell direct, and if so, do you do smaller quantities? (I'm not able to process a whole fleece in my tiny, studio apt.). I'm particularly interested in curly locks - have just started felting, and am so eager to do a wonderful cobweb felted scarf with natural lock trim. Thanks so much!